Discover the history and beauty of one of the Americas’ oldest cities on this sightseeing day tour from Guatemala City to Antigua! On this 8-hour tour, visit top attractions like the Museo del Jade (Jade Museum), La Merced Church, Calle del Arco, Santo Domingo Monastery, San Francisco Church and a coffee plantation. Enjoy fabulous views of Antigua from Cerro de la Cruz, and learn the history of this historical city from your expert guide. See the best of Antigua on this guided sightseeing tour from Guatemala City. Located in the central highlands of Guatemala, Antigua is home to cobblestone streets and terracotta roof buildings that give the city its colonial charm. Visit some of its most famous attractions with your knowledgeable guide. After pickup from your Guatemala City hotel, your tour begins at Cerro de la Cruz, where you can marvel at the whole city of Antigua from atop the hill. Then, head down to Antigua's Central Plaza, where you'll visit San Francisco Church, home to the shrine of Peter of St Joseph Betancur. You’ll then see the famous arch of Santa Catalina, built in the 17th century and once home to Santa Catalina Convent. 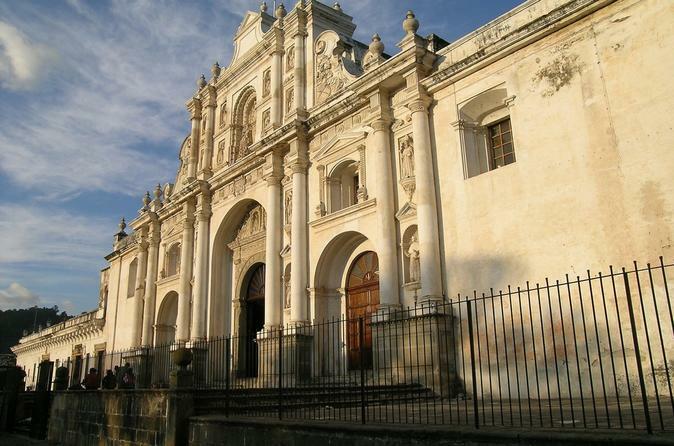 Next, visit La Merced Church, which has a beautiful Baroque-style façade, and explore the ruins of Santo Domingo Monastery, which was once the largest and wealthiest monastery in Antigua. You'll also visit the Museo del Jade (Jade Museum), where you can observe craftsmen turning stones into beautiful jewels. Walk through the jewel gallery to admire some of the prettiest pieces. Have lunch at a local restaurant (own expense) before heading to a nearby coffee plantation. See what goes into coffee making and taste some of the fresh product before being driven back to Guatemala City.